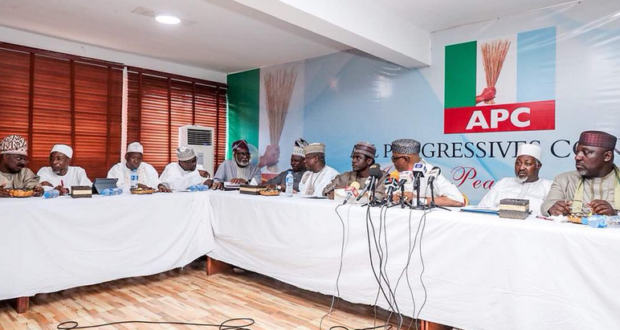 The Plateau chapter of the All Progressives Congress (APC) has adopted the indirect method of primaries in choosing its candidates for elective positions in the 2019 elections. The party unanimously adopted the position at an expanded stakeholders meeting on Wednesday in Jos. Johnclerk Dabwan, former Speaker of the Plateau House of Assembly, moved the motion for the adoption of the indirect primaries and was seconded by Azi Pate, the party chairman in Jos East Local Government. The National Executive Council (NEC) of the party had given the state chapters the privilege of deciding how to arrive at its candidates. Among the options are direct and indirect primaries, as well as consensual agreement. Dabwan, while arguing for indirect primaries, cited security challenge in the state as his major reason. “Having gone through the provisions of our party’s constitution and the resolution of its National Executive Council where it suggested direct, indirect or consensus method in conducting our primaries, I want to move that Plateau should adopt indirect primaries. “The security challenges currently bedeviling us will make direct primaries very difficult and cumbersome,” he said. Stakeholders at the meeting, through a voice vote, adopted the motion after Latep Dabang, the state party chairman, put the question to vote.